The pantry/root cellar under construction. After finishing the chicken coop described in yesterday’s post it was time to start work on the pantry/root cellar portion of the complex. I hired an excavator to dig out part of the hole and give me a head start on the project. While he was here with the machinery he also leveled an area for the rest of the building, dug an extension of the water line so we would have water next to the chicken coop, and brought in road base for inside the barn. The above photo is a bit deceptive in that the base of the earthbag walls is actually several rows lower than it appears. This is because I started out hand digging a trench around the perimeter, using the sand from the trench to fill the bags as I went around. The soil here is nearly pure fine sand all the way to the bottom. But because I am inclining the walls outward to naturally resist any tendency to fall inward, I am not even using barbed wire between the courses. I filled the bags in place and just tipped them down and in place with just folding the top of the bag over and pushing the top up against the previously laid bag. This all happens with a minimum of fuss. Another thing you will notice in the photo is that I placed 6 mil black plastic up against the exterior of the wall before I started the bag work. I cut the plastic big enough to fold all the way up and over the most of the entire wall even when I have reached the eventual height. Doing this conveniently not only provides an impermeable layer between the bag wall and the ground outside, but it also gives me a easy way to cover the bags when I am not working to keep the sunlight off of them. I needed to get the wall at the top of the photo completely done in order to start construction of the rest of building complex. Eventually all of the sand that is still in the bottom of the pit will be used to fill more bags as the rest of the walls are built. Just wondering how you’re progressing with this project – would love to see more…Please? Seems as if a pantry/root cellar would be an ideal room to include lots of built in shelves by spanning poles or scrap lumber across in front of walls between bag layers. Those same shelves can also serve as scaffolding as the structure is built, depending upon how high the ceilings might end up and whether or not scaffolding is even required. An upcoming post will give more details about how the pantry will be outfitted. Those are good ideas. You’re not concerned about them ever collapsing outward because you expect the pressure from the backfill to hold them in place? 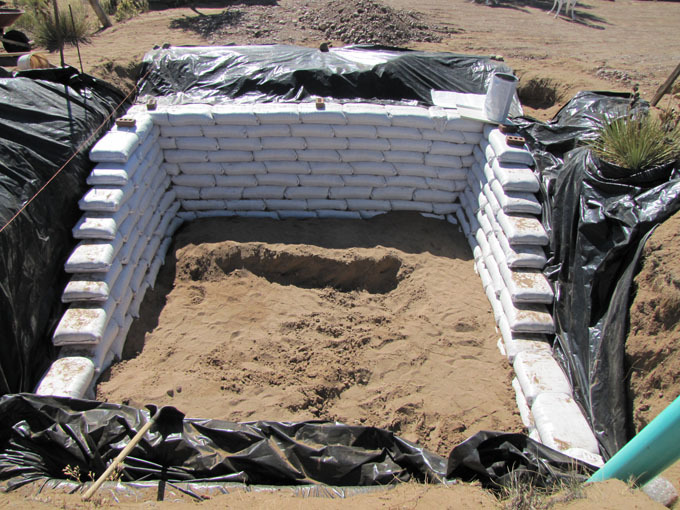 i don’t know if I’d have the guts to build a literal sandbag celler without even barb wire. What are you going to do for the roof? I look forward to more as you progress. Thanks for the post! There is no way they can fall outward because they are firmly supported by the surrounding soil, and there no impulse to collapse inward with the substantial incline outward. The roof will be a shed roof framed with wood that is attached to the barn.